TheHappyHaven – For the love of all things nerdy! For the love of all things nerdy! Check this cool new app out!! This gem arrived in the mail yesterday. There’s nothing better than getting a comic book out of the blue, like a surprise Christmas present. I’ve read this twice already since then. Original books are where it’s at for me these days. We are living in a glorious time where most of the gates and barriers have been removed. Indie books and creator owned media are giving us access to things to watch and read like never before. It’s truly a wonderful time to be a nerd. So, Wolverton graced my mailbox thanks to the talented writer behind this charming thief and his first harrowing chapter. The book itself is gorgeous and the art style is instantly engaging. On the level with League of Extraordinary Gentlemen, but, with it’s own life and style. The sets and scenes beautifully rendered and unique. The action and direction are easy to follow. My personal favorite is the double splash page. The writing matches the art and brings a charm that ties both elements of the book together perfectly. I personally couldn’t help but hear Cary Elwes’s voice while reading Wolverton’s charming and witty banter and inner monologue. The story weaves magic and science together set in a romantic era. A family pledge to right a wrong sworn for generations. Romance, conspiracies, and a world at the brink of war are all alluded to in this first peek behind the curtain of the universe that’s been created for us. Issue 2 honestly can’t come fast enough. Who are the Golden Dawn? What’s Gray’s role? Will Isa help Wolverton or leave him heartbroken and needing a new source of help? Just what power does the Hope Diamond really hold? These are questions I eagerly await the answers to. Get your hands on Wolverton Thief of Impossible Objects issue 1 and find out along with me. Congratulations to the talented crew behind this truly beautiful first chapter. The Prisoner February 14th 2008. I’ve learned something the past couple of months. The mind is powerful. Even now, with all the science, research, and psychology we don’t understand all of it’s capabilities. When you’re inside it, truly inside it as I am, you’ll find it can be beautiful. Filled with memories and everything you’ve ever felt or experienced. Notice that I’m not talking about the brain. Like most, I thought they were one and the same. The mind is contained within the brain physically, however, it is it’s own separate entity. Seemingly limitless, free of physical constraints. Over the course of a normal life a mind grows symbiotically normal. Storing memories and creating dreams, as well as all those nostalgic associations we seem to spend so much time chasing. A smell, a taste, a sound. A certain way the sun shines on a given day that takes us back to a childhood afternoon, free and still invincible during summer vacation. It’s a hyper reality. When a trauma is suffered, as I’ve recently learned, the mind has a capacity to become corrupted. It can become a nightmarish landscape of phobias, rampant emotions, and sometimes under the most dire of traumas, schisms. I realize that I’m prattling on and on as I write this to you, but, maybe this will help you understand what you’re dealing with. It’s taken almost everything I have to get this to you. Exhaustion is setting in even with this brief letter. It’ll mean hell for me if he finds out I contacted you. It’s worth the risk. If you can catch up to him, kill him, even if it means killing the both of us. He won’t stop, I don’t think he can. He’s not human. He comes from a traumatized mind. He comes from me. The letter arrived on my desk yesterday courtesy of an anonymous unmarked envelope left at one of the most gruesome homicide cases I’ve ever had to investigate. It was a God awful mess. Local drug dealers, vice had been tracking them for a while. What was left of them didn’t leave a whole lot to identify. There’ll be a lot of closed caskets after we’re done forensically. We only knew who they were by the symbol embossed on the drug packets. Weird thing is, the money was gone, the dealers were dead, but the drugs were still there. This wasn’t a turf hit. The letter, stuck into the top of a random head on a table, was the only real lead we had. Blood covered and hastily written, as if under duress. That was all we had to go on. There was no evidence. Just the letter, and a name. Who was Andrew Solomon? A search of every crime database got me nothing. A social media search gave us a list of everyone with a matching name, and every weird variation. You’d think it’d be hard to be untraceable in this day and age. You’d be wrong. As a homicide detective a quick search of my name, Jason Deschain, will show you my years of service, my precinct, and whatever “famous” cases I’ve been a part of. This Andrew guy was a ghost in the wind as far as we were concerned. I was currently running searches on similar crime scenes. Had any precincts received any letters like this? Was anyone else looking for an Andrew Solomon? So far, nothing had hit. We dubbed it the “monster killing” and that was as far as we’d gotten. Surely a crime this visceral couldn’t be an isolated incident. Unfortunately we’d probably see this again, hopefully Solomon would stick to criminals. Either way, I’ll find him. Either way, I’ll get to the bottom of this. The next chapter : What creates a monster? Hey guys! It’s been a while. 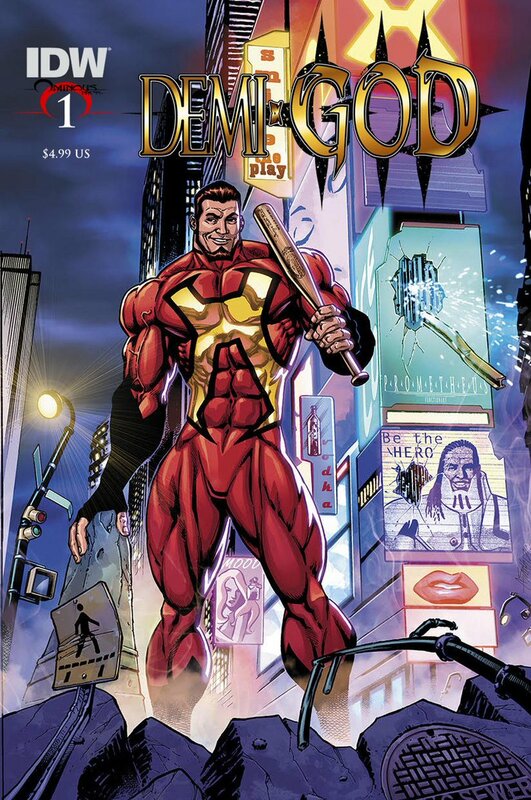 Wanted to tell you about a new upcoming comic book title Demi-God! Brought to us by the collective genius and talent of Ron Marz and Andy Smith! Put out by their company Ominous Press. I was given the chance to read the first issue early this week and I can assure you, you’ve gotta get your hands on this when it hits stores in March. As if that’s not enough there’s a Kickstarter for an oversized Graphic Novel. The oversizing is not an understatement. The book will be larger than a traditional comic with awesome bonus features. The story itself is a funny and engaging new take on the “superhero”. Old world Gods meets modern day loser to create a new type of hero. Andy Smith’s art jumps off the page and Ron Marz’s dialogue is hilarious. Anyone who can appreciate fourth wall antics and self-deprecating humor will be pulled right in. A sign of a good book is when you hate reaching the last page. That was definitely my experience with this opening issue. You can find the creators online on Facebook and Twitter. The Ominous Press website has a market built in where you can preorder upcoming titles like Demi-God and also get issues and graphic novels for their other titles. I highly recommend Dread Gods on top of the upcoming Demi-God. When you were young….an 80’s kid looks back. More and more in this tumultuous and divided modern society I find myself looking back at a time when life seemed calmer, more civil, and for a kid magical. Cartoons dominated afternoons and Saturday morning. Movies were incredible and seemed to never stop coming. Comics were beautiful, centered, and easy to follow, let alone to keep up with. Holiday specials were a treat. The commercials even better. Local department stores still existed, having not succumbed to the big box store’s life extinguishing presence yet. These stores had some of the best Christmas and Halloween commercials. Speaking of Halloween, remember when costumes were just fun? We didn’t have to be lectured to, we were left alone to have a holiday with friends and family. Superheroes actually taught morality and right from wrong. It wasn’t yet a mournful hardship to have superpowers. They inspired us to be better. They stood for what was right and just, despite societal pressures. They were happier and gave us hope. As kids we could disappear for whole parts of what seemed like endless days. No parents were turned into the local police for letting us go off with friends or for a bike ride. Exploring, playing, and more were encouraged, if not enforced. Some of the best memories were made without a parent hovering like a paranoid helicopter. School was a place of learning and discussion, not indoctrination and test prep. Teachers were free to teach and not be shackled to a preapproved curriculum and a politically correct minefield between them and their students. Holidays were celebrated and concerts were free of shallow malcontents. I miss this time. The last generation to know freedom, real freedom. To have hope in the future. This freedom and hope has not only been robbed from me, but from every adult and heartbreakingly at least two generations of our children. Most of what they see is the world is broken by too many things to count. Heroes are either villains or barely above them. Fear is more important than freedom. School is a test prep factory and everything that isn’t liberal is archaic and wrong. They know the government is much better at taking care of things than they or their parents are. They learn this beautiful free country is really horrible and oppressive. There’s no limitless future and freedom, real freedom is dangerous. Hey guys, quick post. I’ve been doing a podcast for a few months now. One thing I’ve learned is to book the guests that make you happy. Whatever your show is about, reach out to the people you really want to talk to. I’ve had a blast and a half talking to people who make comics and movies, voice actors and more. Meeting some heroes has been incredible. Meeting really cool people in different entertainment fields has been rewarding. Making friends and connections with so many talented people has been a great privilege and adventure. It makes the work of putting a show together the best part of the week. I was going to see this movie no matter what personally. Today, however, I got to watch it in an unexpectedly beautiful way. Through the eyes of my 10 year old daughter. Finding the feminist movement a little too shrill and militant for my taste it was wonderful to see female empowerment done so beautifully. Readers should know that I’m the only male in my house, so, the feminist comment isn’t a knock against women at all. My wife is the strongest most kickass woman I know, and she doesn’t want to be affiliated with them either. Director Patty Jenkins has directed a masterpiece, and I daresay, the best best live action DC movie to date. My daughter was riveted and the scenes of a young Diana resonated far better with her than any Disney princess. Her smile while watching the young version of our hero train and mimic the Amazonians fighting was priceless. She was able to see herself in a young Diana. Channeling an almost inner hero waiting to emerge inside herself. Rarely is she this engaged in a movie. Seeing a fully grown and ready to take on the world, literally, she was able to see someone to truly admire and emulate. More than any celebrity or pop star, she found a truly worthy woman to be inspired by in that theater. She kept bumping my arm and just smiling over and over again. She brought her Wonder Woman action figure with her to the movie and more than once pantomimed Diana on screen. I got a little choked up seeing her for the first time find a hero as I did as a child of the same age. Only this time it a hero for her. Not a super powered guy to crush on, or a secondary female character. Wonder Woman was hers and hers alone. It was beautiful. The characters are all well represented. Steve Trevor was written perfectly. His heroism was his own and was never overshadowing of Wonder Woman or diminished by her either. A truly exemplary example of men and women working together. I myself am the Steve Trevor to my wife, and yes, she is the superhero in our family as well. The action is perfectly choreographed and the overall arc is engaging. The cinematography is breathtakingly executed and is worthy of an Oscsar. Gal Gadot was the best part of Batman V Superman and she delivers even more this go round. Aside from her beauty, a more believable woman to step into those boots would be undoubtedly impossible to find. Her real world combat experience only lends itself to the character. Her grace on screen is magnetic, and you find yourself involuntarily following every emotion she goes through in this first foray into our broken world. She is truly the Wonder Woman we’ve been waiting our whole lives to see. Lucy Davis as Etta is an utter delight. Her wit and ability to take charge, shine through in a world still very much dominated my men. Her quips are truly funny and she brings a smile to your face every moment she’s on screen. Watching her take inspiration from the brashness of Diana is really inspiring. You can see a strong woman overlooked in her time period begin to stand on her own. A perfect homage to the women of the era who finally stood up and said enough to real patriarchy. All this aside, it truly was amazing to watch this movie for myself, and more so to watch my young daughter. It was truly eye opening for her. Women can be strong and gentle. They can be assertive and brash without being shrill and off putting. They can stand on their own without being standoffish. Beauty and strength radiate from inside without being overly confrontational. Thank you Patty for making a movie that should define the entire tone and direction of the DCEU. You are truly a gifted director and you’ve given us the gift of a masterpiece to enjoy. Thank you Gal for showing my daughter a hero to look up to. Thank you for showing her the Wonder Woman she can grow up to be. Thank you Lucy Davis for showing my daughter a real woman who can stand up in a world of men without super powers. Thank you ladies, you’ve made a great movie, and more than this, you made a 10 year old girl’s dream come true today. You are all truly Wonder Women.